Inspired by the true events surrounding bands of smugglers who staged minor battles raiding supplies at night to combat their existence being taxed to death by King George and most likely equally influenced by The Scarlet Pimpernel-- author Russell Thorndike created the Robin Hood-like vicar Dr. Syn (played by Patrick McGoohan) who runs a parish by day and becomes a daring smuggler by night. Donning a mask to become "The Scarecrow"and hiding his true identity from a vast majority of the community aside from his most-trusted sidekick Mipps (George Cole), Thorndike's character has become one of the most enduring in popular culture, inspiring Zorro and numerous other masked men, including possibly Batman or at least his villain also named The Scarecrow. Originally conceived during a sleepless night where Thorndike and his sister comforted themselves following a murder in their hotel by telling stories to pass the time, his educated and polished Dr. Syn first appeared in print in 1915 and later caught the attention of book lover and adventure enthusiast Walt Disney. Utilizing the London satellite studio that Disney completed in the 195os-- viewers were first treated to a riveting and far more politically correct retelling in a three-part miniseries on his Wonderful World of Color program in 1964. One of the most requested titles in the entire Disney catalog, fans have been longing for a DVD set for years but as Walt Disney Treasures co-creator and host, the Disney expert Leonard Maltin notes, due to the studio's reputation and demand for the highest of standards, they wanted to wait until they could present a version that is not only technologically awe-inspiring but also could recapture the way that the show looked both when it first aired and also when it was trimmed down into a popular feature-length film. Taking great pains to remaster the film-- it's now presented in its widescreen glory and using the same original negatives and recorded master tapes so that the 2-disc set offers audiences the opportunity to relish in the 5.1 surround sound or stick with the monaural audio track for purists. And because of the film's emphasis on numerous night scenes and dark color schemes, the technical efforts put into the film were of the utmost importance to manage and recreate exactly what Disney filmmakers were going for at the time without brightening it or changing the exposure. 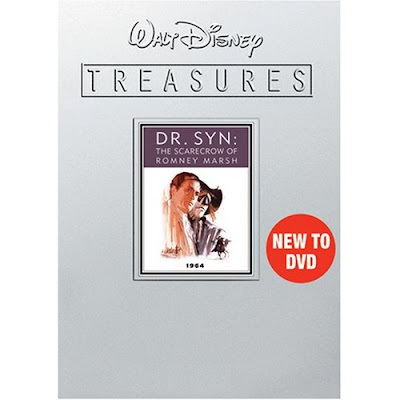 Also containing both the cropped and widescreen introductions to each episode by Walt Disney himself in a series of promos that manage to capture his enthusiasm for the project and convey his ambition to offer viewers a grand tale of escapism and adventure, history buffs and those who want to look deeper into Syn will also want to seek out some of the bonus features including a great sixteen minute mini-documentary on the history of the Scarecrow/Syn legend. With historians and literary experts arguing about the multi-faceted layers of a tale that “on the suface...[seems to be] a story of high adventure,” but love and compassion run throughout as well as the intriguing presentation of a hero unafraid to serve up his dark side, they also note that he has “all the elements of a villain." Yet, interestingly for a hero, he is on the side of justice and the common man, urging them to rise up against oppressors like King George and join forces with Americans also seeking sedition. Boasting a wonderful performance by its leading actor and with all of the Disney departments working in tandem to bring audiences a rich and literary work of excitement and drama-- admittedly the three part series may best amuse the die-hard devotees but the feature-length film (named Dr. Syn, Alias The Scarecrow) on Disc 2 is just as riveting and exciting as Zorro and Robin Hood. A Disney creation of which I was unfamiliar and one with a theme song destined to stick in your head-- the release of Romney is also coming at a time that would no doubt intrigue its fictitious character as again we as a people are struggling to feed and clothe our families. While of course, it's not recommended to "Go Scarecrow" or become an avenger, the idea that citizens can stand up for themselves and exercise their first amendment right as well as the right to peaceful assembly is one we're seeing again and again today. And although thankfully, we no longer have to hide behind masks, I'm sure we'd all love to have a theme song half as cool as Dr. Syn's.